It was one of those days. Nicolas Madrid was under a truck working on the carriage when the brakes failed. "It was downhill," Nicolas said. It dropped on his arm and shoulder. “It was like three or four minutes," he explained, "people tried to push it back, but it rolled back on me again." Following surgery on his left arm and shoulder, physical therapy would be critical to full recover. 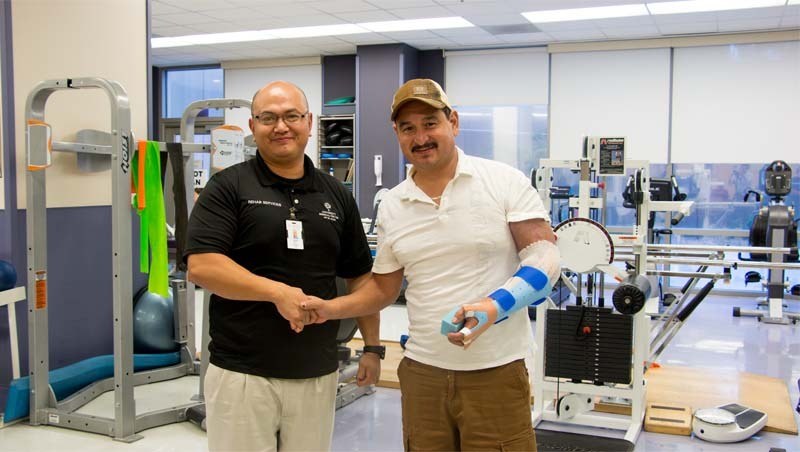 University Medical Center’s Department of Rehabilitative Services physical therapists, managed Nicolas wound care with treatments to reduce the swelling. They even fabricated a custom brace so Nicolas could start using his arm again. "I got very emotional the first time I came here…" remembered Nicolas. "…all the stuff they do here, they do it with passion and love." Composed of specialists in evaluation and management of wounds, UMC’s wound care team follow the patient from inpatient admission to discharge for outpatient services. Their goal is to heal wounds, restore function, and promote general wellness. University Medical Center of El Paso offers four Outpatient Rehabilitation Clinics for El Pasoans: University Medical Center of El Paso at 4815 Alameda, UMC’s Westside Clinic at 6600 Desert Blvd N., UMC’s Northeast Clinic at 9839 Kenworthy St., and UMC’s Eastside Clinic at 8360 Burnham. All offer physical therapy, occupational therapy, and speech-language pathology services to patients with impaired mobility, communication, or difficulty doing daily activities.